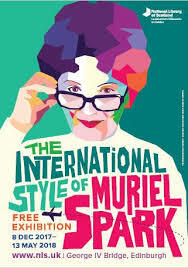 As part of Creative Scotland and the National Library of Scotland’s year-long celebration of the life and works of Muriel Spark, the International Style of Muriel Spark exhibition is being held at NLS. Spark, who said she threw away “practically nothing on paper”, forms one of the largest archives at the library, and the exhibition takes full advantage of the collection including diaries, correspondence, workbooks, and manuscripts of some of her most famous works. The NLS exhibition space is a neat, quiet room leading off from the bustling foyer. An artist’s colourful rendition of Spark looms over the shadowed entranceway with a cheeky smirk and tilt of her glasses; you feel as if the self-confessed people watcher is observing you observing her life. Upon passing through the glass doors and a “strictly no photography sign”, visitors are suddenly met with a 12ft wall. It’s an unexpected obstruction that forces visitors to pause and read the exhibition introduction. The centenary exhibition takes you on a journey through the places where she lived and wrote. Like a Spark novel, the chapters of her life are told out of time, revealing not only what happens, but why . . .
Rome: Success – The Public Image. As it turns out, it also serves as a map for the U-shaped exhibition space. Visitors must choose to begin with Acclaim and end at Success or vice-versa, but either way, they begin and end in Italy, the country where Spark finally chose to settle. Whichever route you choose, you are led into a maze of colour and glass; the large boxy display cases and jutting walls divide the room into narrow corridors painted with a rainbow of colours from a muted 1970s palette. Everything is sharp angles and blind bends. The spot lighting is my favourite part of the design; those places and periods of Spark’s life that were sunny and successful are brilliantly lit, and those places that were difficult lie in shadow. The gloomiest of all is the Africa exhibit, with its deep shade and harrowing quote across the wall – “It was there I learned … to put in a peripheral place the personal sorrows, frights and horrors that came my way”. The display media in each area vary, from visual and audio recordings of Spark at various points in her life to an interactive map of her poetry in the Africa area and, of course, the collection of notebooks, letters, newspaper articles, telegrams and dresses from the archive. The telegrams and correspondence are fun and interesting. They include thank-yous from Elizabeth Taylor and Maggie Smith and appreciation notes from Graham Greene, Evelyn Waugh, Doris Lessing and John Updike. The jewel in the crown is a peek at the manuscript of The Prime of Miss Jean Brodie. The most interesting manuscripts, however, are the James Thin spiral notebooks that she preferred, open to scribbled pages with sometimes large and sometimes small edits, and long passages that survived into her novels. The exhibition delivers on its promise to “reveal the what and why” of Spark’s life and works. Not only do the displays offer insight into the influences of her writing, her travels and her experience, but the colourful and claustrophobic spaces recreate the quintessential style of her writing.